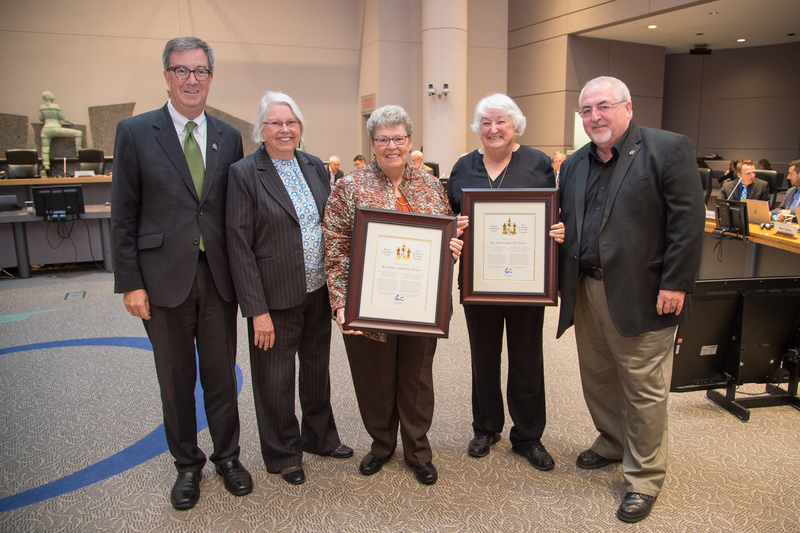 Mayor Jim Watson, with Councillors Marianne Wilkinson and Allan Hubley, recognized Kay Dubie and Liz Tucker’s dedication to the community at today’s City Council meeting by presenting them with the Mayor’s City Builder Award. Kay Dubie began her volunteer work at the Kanata Seniors Centre in The Craft Group as a volunteer knitter and soon became and continues to be the Chair of the Kanata Seniors Craft Group. In this role she coordinates the operations of the group, which includes sponsorship of seniors’ services in the community, notably donating $10,000 to the local Hospice Care Ottawa facility. In September 2010, Kay became the Vice-President of the Kanata Seniors Council Inc., a local community association that advocates for seniors’ needs in the community. Part of her role with the Council was to implement an annual seniors’ games program. Kay then became President of the Kanata Seniors Council, leading the board through its various operations, Council Cafe, Instructional Computer Training Program, Travel Trips and other services for seniors in the community. Kay is now Past President of the board. Kay’s unwavering commitment to the Kanata Seniors Council Inc. and the partnership between the Council and the City of Ottawa is reflected in the quality of services available to seniors in the community. Liz Tucker has been a long-time resident of Kanata. She began her volunteer work at the Kanata Seniors Centre as a front desk receptionist where she greeted many friends and neighbours and introduced other seniors to the activities available at the Centre. She quickly expanded her volunteer role to join the Centre’s Special Event Team where she helped to coordinate and implement special events for the members of the Centre. In January 2010, Liz became the Treasurer of the Kanata Seniors Council Inc. In addition to her responsibilities as Treasurer, Liz also stepped forward to implement the annual seniors’ games program. The launch of the Far West Fun Fest began in May 2011 and saw 200 seniors participate in over 20 activities in a two-week period. This program is still going strong. Outside of Liz’s involvement with seniors, she is still an active volunteer with the Friends of the Library, Beaverbrook Branch, assisting with fundraising to augment the services available to the community.